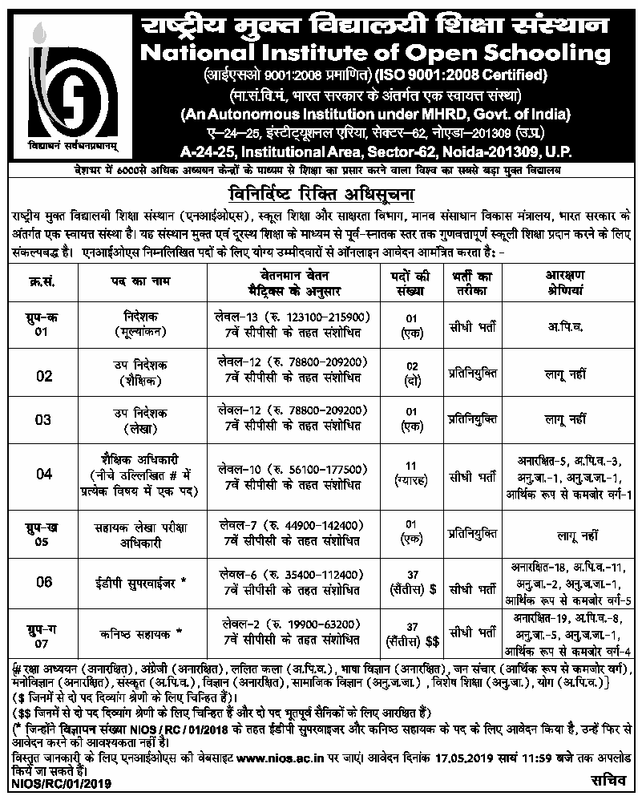 NIOS UP Junior Assistant Recruitment 2019 Here is 90+ category wise posts Junior Assistant, EDP Supervisor, Academic Officer and Other Deputy Director type posts jobs in Noida, UP. National Institute of Open School word under Central Government authority of Department of School Education and Literacy, MHRD, Government of India. The Online Application Form will be invited from 17 April 2019 nd up to 17 May 2019 U can upload all your document on official website. NIOS EDP Supervisor Recruitment 2019: Latest News 14 April, NIOS invites 90 Group C vacancies in Nios Noida Recruitment 2019 where some posts are to fill on direct recruitment and some posts on deputation basis. 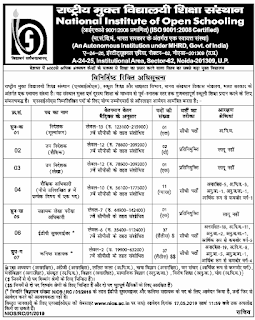 You must kindly check NIOS Group B Recruitment 2019 before NIOS Assistant Last Date. How to Apply NIOS Noida Supervisor Recruitment 2019: Interested and Eligible candidates for detailed information please log on to NIOS website www.nios.ac.in. Application can be uploaded up to 17.05.2019 till 11:59 PM. Selection Process: Merely fulfilling required eligibility criteria shall not entail the candidate for calling for written test/Interview.